I’ve never held Charles Dickens in the high esteem that many others do. Granted, I’ve only read one of his novels in its entirety — Hard Times (1854). Based solely on that book and the story “A Christmas Carol,” which I’m pretty sure I’ve read in its original form at least once, Dickens was a splendid caricaturist. I could picture every facet of the grotesque antagonists and tenacious protagonists of Hard Times. They looked and acted like real people. But it was all on the surface. None of them felt like real people, and I was never convinced that they had internal lives or realistic motivations. I’m a big fan of psychological realism and believable characters, so if I’m going to read a Victorian novel, I’d much rather it be by George Eliot or Thomas Hardy than by Dickens. But based on the roughly 25% of the novel that I did read, David Lean’s Great Expectations seems like a pretty solid adaptation. Orphaned boy Phillip “Pip” Pirrip (Anthony Wager) lives with his ill-tempered older sister (Freda Jackson) and her husband, Joe Gargery (Bernard Miles), a kind-hearted blacksmith. One night, out on the moors, Pip is accosted by an escaped convict, Abel Magwitch (Finlay Currie), who makes him promise to return with food and a file with which to saw through his chains. The terrified Pip keeps his promise, but the authorities arrive on the scene, Magwitch attacks another escapee, and they’re both taken back to prison. Soon, we meet one of Dickens’s great grotesque characters, Miss Havisham (Martita Hunt), a mentally twisted shut-in who is gleefully brainwashing her beautiful young charge Estella (Jean Simmons) to be the ultimate heartbreaker, and punish men who are foolish enough to fall in love with her. Pip is sent to Miss Havisham’s on a regular basis to improve his manners, but it should go without saying that he ends up receiving a very different kind of education. All of this is very well done, and beautifully filmed — especially the scenes at night on the moors. The problem for me came after about 40 minutes, when several years pass and Anthony Wager is replaced by John Mills — as the adult version of Pip — for the rest of the picture. Although Pip has only supposed to have aged a few years (from boyhood to manhood), Mills was 38 years old, and the effect is jarring. He’s perfectly handsome, but he just doesn’t look like a young man starting out in the world. The other major actor to change is Estella, which is even more jarring. The gorgeous 17 year-old Jean Simmons is replaced by the 29 year-old Valerie Hobson, who is far less charming than Simmons and looks nothing like her. 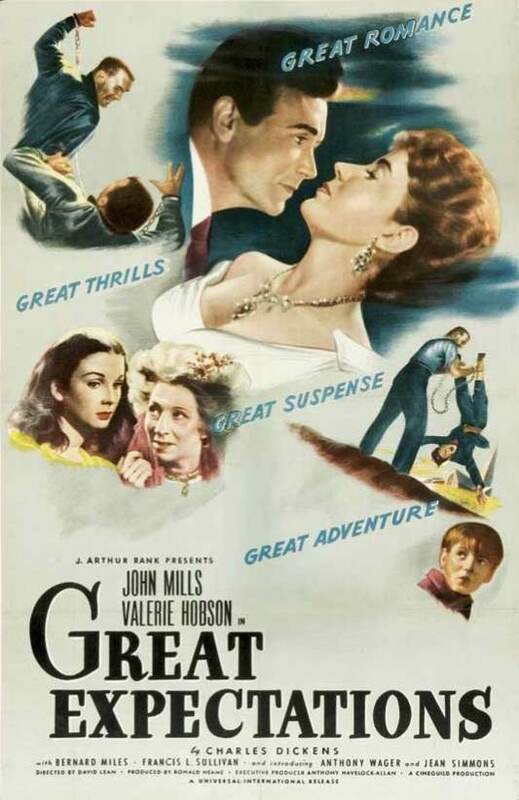 Great Expectations premiered in the United Kingdom on December 26, 1946, and opened in the United States during the spring of 1947. 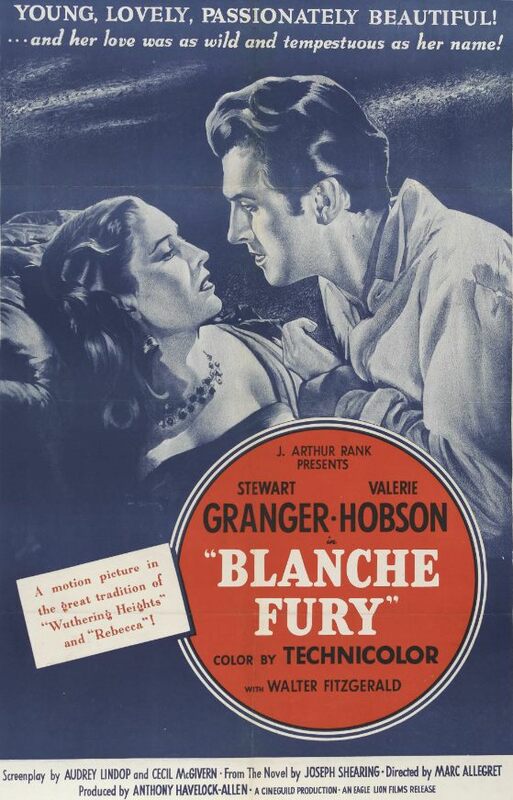 At the 20th Academy Awards, it was nominated for best picture, David Lean was nominated for best director, and the film was nominated for best adapted screenplay. It won two awards, one for best black and white cinematography and one for best black and white art direction. I enjoyed it, but the change of actors in midstream and the general Dickensian nonsense of the plot kept me at arm’s length. Great Expectations is beloved by a great many people, however, so if it sounds as if it’s up your alley, by all means check it out. Posted in 1946, December 1946 and tagged 20th Academy Awards, Alec Guinness, Anne Holland, Anthony Havelock-Allan, Anthony Wager, Bernard Miles, Cecil McGivern, Charles Dickens, Cineguild, David Lean, Drama, Edie Martin, Eileen Erskine, Everley Gregg, Finlay Currie, Francis L. Sullivan, Frank Atkinson, Freda Jackson, General Film Distributors, George Hayes, Gordon Begg, Grace Denbigh Russell, Great Expectations, Guy Green, Hay Petrie, Ivor Barnard, Jack Harris, Jean Simmons, John Burch, John Forrest, John Mills, Kay Walsh, Martita Hunt, O.B. Clarence, Richard George, Ronald Neame, Roy Arthur, Tony Wager, Torin Thatcher, Universal Pictures, Valerie Hobson, Walford Hyden, Walter Goehr. Bookmark the permalink.